Do some things have no place in a modern Local Government Office? Yesterday a piece of paper appeared on my desk. It had been folded into three sections, and then placed inside another, larger piece of thicker paper which had been specially folded and glued together to hold this first piece of paper, before being sealed with a gluey gum. My name and address had been put on the front. Apparently, this is called an ‘envelope’, and inside it was a ‘letter’. Somewhat confused (I thought an envelope was the amount of cash that a service had available to it and a letter was any of the squiggles printed on my keyboard), I opened it and read the contents. Imagine my surprise to find that it was an invitation to a meeting taking place just a few hours later that day. I already had the meeting invite in my Outlook calendar, had e-mails discussing the agenda items and knew where and when it was, but the letter was sent nonetheless. It was a little strange to think that one day, not that long ago in the grand scheme of things, this was perhaps the way these things were done. These days written invitations like this have little place in the modern office, even if it did for a few seconds make the meeting – and by extension my involvement in it – more important than it actually was. And it got me thinking about some of the other things that still appear from time to time which really should have been put out to pasture many years ago. Here are a few. Before the days of scanners and e-mail, the only way to get handwritten comments, signatures or even basic information from one place to another almost instantly was to send a fax, and the remnants of this time can be found on most local government officer’s e-mail signature. Many of us still persist in putting the office fax number at the bottom of our messages despite not knowing where said fax machine actually is, nor how to use one. Some teams still insist on faxes being sent when a signature is required for approval. Even without getting technical with all of the many other options available, most photocopiers these days also double up as scanners. A quick scan, or even a photo of a document on a smart phone, does at least as good a job as a fax machine and has the added benefit of actually being able to be used by officers without waiting for the tell-tale schreeching so reminiscent of the iconic Commodore 64. Once upon a time, this was a really good idea. A simple whiteboard was displayed which laid out the names of your team, and then you simply filled in the space next to your name to say where you were and when you would be in the office. In fact, it was such a good idea that Microsoft and other software manufacturers developed tools like Outlook and shared calendars, allowing you to fill out your daily comings and goings as required as well as seeing those of your colleagues. Not only does this have the added side benefit of removing the need for dog-eared paper diaries (although these will persist for some time yet), it also takes away another process to be done every day, and assuming you keep your diary up to date has the bonus of always being accurate. Admittedly, it is harder to draw phallic pictures on your Outlook calendar. Finding a new corridor in the Town Hall recently (well, new to me anyway) I noticed a room with a handful of desks and staff tapping away at keyboards, each with a piece of paper stuck to a clipboard stuck to the side of their monitors. Upon inquiry I found out that this team of people were our administration pool, who essentially spent their days typing up notes from senior managers into e-mails or documents. I understand the need for adminstrators; indeed, in my m,ind they are some of the most important people in any office, and are fonts of knowledge and contacts who can turn whimsical ideas of others into reality. So using their time to type, a skill which should be literally at the fingertips of any self respecting manager, is perhaps not getting best value from them. When typewriters were the norm there was a place; these days it is probably quicker to type yourself than to handwrite, pass over, have them type, read it, make some changes, let them retype it, read it again and then forward it on. Stop being lazy. A while ago I did some work with our parks and open spaces team, looking at revamping some of the borough’s parks. This involved getting a lot of information from the public and then using it to create some potential plans to take back out to people who used that space. Imagine my surprise when I found out that these maps are hand drawn using easels, pencils, rulers and protractors, before being coloured in by hand using wax crayons. Perhaps I’m being a little harsh, but surely the same thing produced using a computer system would be better? Repeating elements such as trees and bushes would then be simply cut and pasted rather than repeatedly hand drawn, clouring in would take a couple of clicks of the paint bucket, and perhaps the data could even be uploaded onto a GIS map. Don’t get me wrong – I actually love a good map and appreciate a draughtsman’s skill, but in these days of computer aided design it was a shock to see these things still done by hand. As ever, we’d love to hear about anything you see in your office which just seems a little, well, 20th Century. Via Twitter (@welovelocalgov) or the comments boxes below, you know where we are. Then some are simply madder than a snakes armpit. When this glorious missive was forwarded on to us by three different members of the WLLG press pack we knew it was worth sharing more widely, so here it is in all its anonymised glory. Tags: double take, health and safety, tea, what the?! A few weeks ago my service head asked me to put together a Powerpoint presentation which covered everything that’s gone on in the department over the last year: our achievements, savings programmes, what projects we’re leading on, what is going to happen next year, and so on. Of course, this request came in at the last-minute – why would I need any time to research it properly and speak to the many people I needed information from? But that isn’t where the fun begins. Nor does it begin when her only comments on the first draft I sent through read ‘more positive survey results info please’ (pretty much those exact words), or even when she actually did give me proper feedback and it consisted mainly of requests for information that she knew full well didn’t exist. Tags: handwriting, manager, notes, what the?! Can't things be linked up a bit better? As a child my mother used to tell me that if my head hadn’t been attached to my body, I would have forgotten it most of the time. As I’ve grown older my memory has not improved one jot; I still regularly forget things to add to the shopping list, dates and events as well as forgetting to take the rubbish out. Our ICT department do not appear to be sympathetic to my plight however. Recently a brand new layer or two of ‘security’ has been forced upon us. There was nothing demanding that this happen, but some ICT people decided that it could be done, therefore it should be, and to hell with the consequences and impact it has on the rest of the staff. Tags: access, computers, helpdesk, ict, IT, password, phones, problems, systems, what the?! Hold onto your seats and don’t adjust your screens, I am about to say words I didn’t ever expect to say. 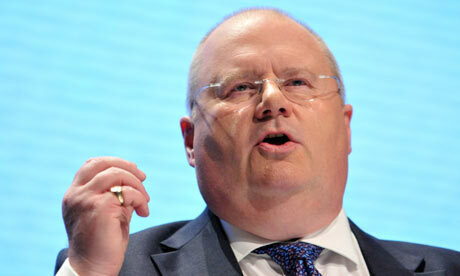 I agree with Eric Pickles. Not generally of course, but recently he has decided to attack local government in a new (and seemingly random as ever) way, this time under the mantle of transparency and openness. Yes, the Pickleator has written to local government and told them that bloggers should have the same rights as the accredited press. Tags: accountability, blog, bloggers, council meetings, eric pickles, journalist, open, open government, shock, social media, transparency, what the?! There are an awful lot of very big issues facing local government at the moment which have been blogged about by ourselves and by many others far smarter and more linked in than we are. There are also major issues facing individuals within services and teams which will affect their lives and future. That being said, sometimes it’s the little things that count. Issues that perhaps might have been looked over in the past seem to be far more annoying now, and I find my degree of ire rising along with an emergence of a hitherto undiscovered rant gene within me. Tags: annoying, lifts, milk, not important, social media, stationary, toilets, what the?! The team of bloggers here see and hear a lot of random, slightly strange things to do with Local Government, be they structural, procedural or the actions of people. That being said, we are always looking out for other things which might be amusing, so should you have any points you think are a little, well, strange or interesting you can always contact us at welovelocalgovernment@gmail.com. I wonder how many of my walking peers remember last summer? Does anyone remember it ?-because for me it certainly was memorable for having been introduced by Rachel, Kirsty and Keith to lunchtime explorations of the area-an area of hidden delights – history, beauty and revelations – both human and ecological. But now those lazy , hazy days of summer are gone (apologies to that wonderful supremely talented American singer-the late Nat King Cole) and now as I try to tempt my constant walking companion to venture out ,she would peer up at the luminous grey sky ,wrinkle up her pert nose, flick her dark hair and say”thanks but no thanks- I think its going to rain -summer’s ended”. Tags: drunk, e-mail, ramble, walking club, what the? !